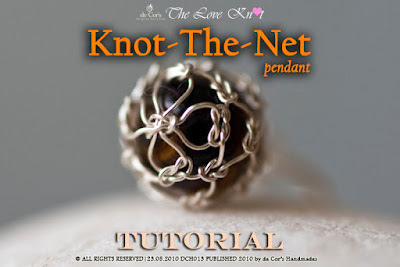 Note: My plan for this year was to focus on creating jewelry product as well as inventing new technique, I am setting aside all my projects on hand at the moment to come up with this tutorial. Knot-The-Net Tutorial's price is currently being marked down by 30% to celebrate me publishing the first Wired Chinese Knot tutorial after the 6 months break due to the high demand of it's instruction. We reserve the right to revise the price without prior notice - SO GRAB IT NOW! Level: Advance. Though if you follow closely, there will be no reason you to fail to make this. Please have faith in yourself, and me. This tutorial is composed using 81(including coverpage) high-resolution pictures, all steps and procedures are zoomed and focus to deliver the precise instruction via a set of terrifically clear pictures.